The double burner griddle/grill is an extra thick oversized commercial cast aluminum which conducts heat fast and evenly. 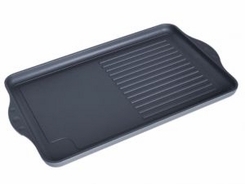 It fits over two burners and is halfsided flat and with deep ridges for collection of fat. Ideal for low fat cooking.